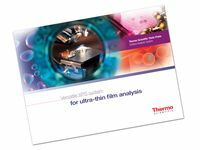 The Thermo Scientific™ Theta Probe is a high performance XPS system designed for ultra-thin film analysis. Angle resolved X-ray photoelectron spectroscopy is the perfect technique for measuring samples across a range of materials. Theta Probe, with a micro-focused X-ray source and parallel ARXPS analyzer, makes complex thin film measurements simple and intuitive. Theta Probe can be extended by addition of other analysis techniques, such as UV photoelectron spectroscopy, and a range of sample preparation options.